Toyota Corolla Altis is going to be different than everything else, even Corollas themselves. 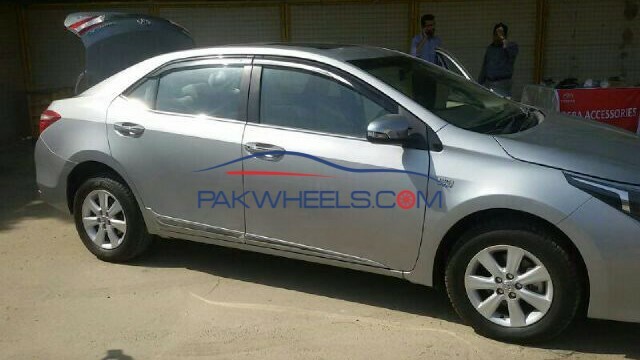 That’s what we have learned through reliable sources about the upcoming Corolla. The previous Altis had to use lame marketing gimmicks to be different than its line-up, like sticking SR emblems which actually just stood for something very basic, ‘Sun Roof’. So this one, would kind of be like what M BMW’s are to their normal, off-the-steroids siblings. I know, I know it is a blasphemous comparison but there isn’t other way to help you better understand the new Altis. New Corolla in general now has a grown up wheelbase by 100mm which translates into larger room within the cabin. That’s a universal growth for Corolla over the rest of the models but Altis is an entirely new car. New and different engine, transmission, gears, steering, et all. We’ll begin with the engine that’s coming in the new Altis, the 1.8L powerhouse is back! It is an all-new engine according to our sources, which has directly ascended from the Malaysian Corolla Altis. It is the 2ZR-FE. 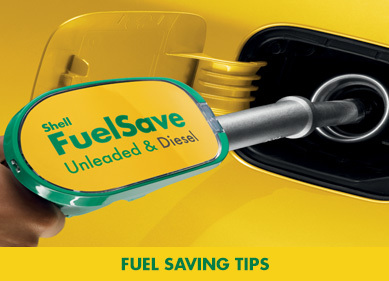 Also to note is that the 1.8 liter engine doesn’t only mean more POWERRR!!! but it also means that the car would be even more expensive. The last 1.8L, the 1ZZ-FE is quite different to the new 1.8 liter 2ZR-FE. 1ZZ-FE produced 124hp and 170Nm of torque while the new 2ZR-FE produces 132 HP and 173 Nm of torques. (According to Malaysian websites) However, the new Pakistani Altis will now have a 7-Speed Super CVT-i transmission or as the geeks would say: Super CVT-i with a Seven speed sequential mode, the transmission is code named: K313, for you geeks out there. Like the Honda CR-Z we drove earlier, the CVT is not a sports or enthusiasts’ transmission but it offers smooth changes and has been reputed for its gain in fuel economy however, it is a dull transmission, but to provide some sense of sporty feel, the Altis has ‘paddle shifters’. Remember City Steermatic? Yes. But this one has paddle shifts at the back of the steering. There are a total of nine colors which includes the all-new ‘Attitude Black’ which replaces the old ‘Solid Black’. There’s one color though, which has been kept as exclusive for Altis; ‘Beige Metallic’. A sporty car, with the most beige color of them all, instead of Monte Carlo Blue or Nova Grey, your paddle-shifting sports Corolla can have a Beige color. 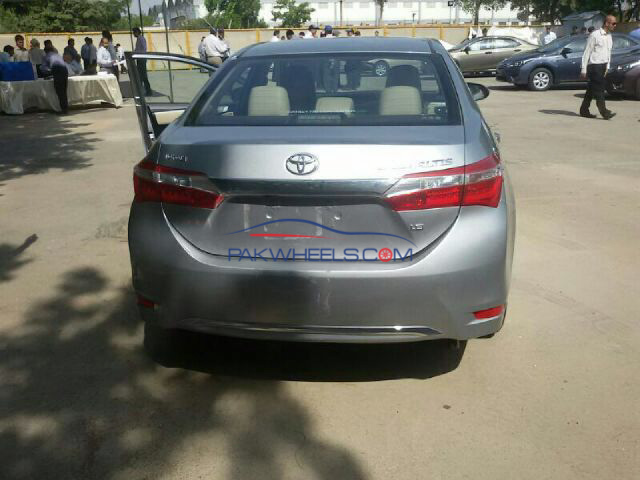 Dark color signify aggressive, attack cars which Indus wants this Corolla to be portrayed as. Where do you spend the time most some would say? The inside. So the interior should be great and comfortable. Well, the new Altis has bucket seats with height adjusters while the rear seats are reclining as well so that’s a plus. 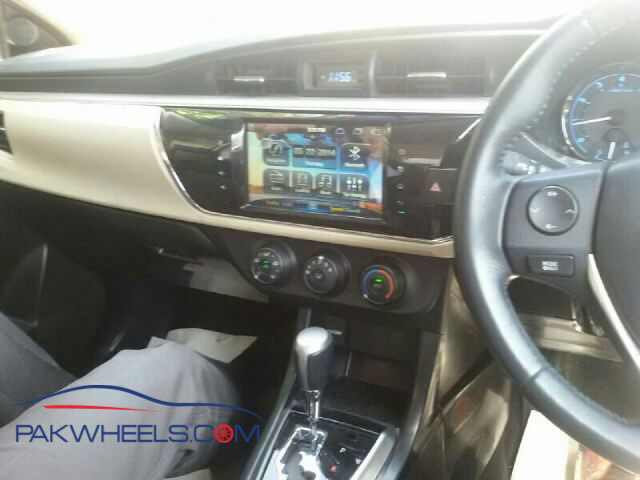 You have already seen the interior shots of the Corolla, and our source says that a multimedia touch system is installed whose name literally starts today and ends three days later, its called by Toyota; “Integrated Design Smart Infotainment System with Internet Connectivity”. Imagine telling that to your friends! Moreover, Altis will have leather steering and audio control buttons on it, and on the back of it, will be the paddle-shifters. Altis will also have cruise control and Switchtronic while all this luxury and techfest can be unlocked by a wireless key, but you still don’t get immobilizer which is the biggest complaint of Corolla owners with Toyota I have known. Talk about mileage, though my source wasn’t able to pull out exact figures but we’re told that the mileage, despite having a CVT transmission, is the same as the new Civic. 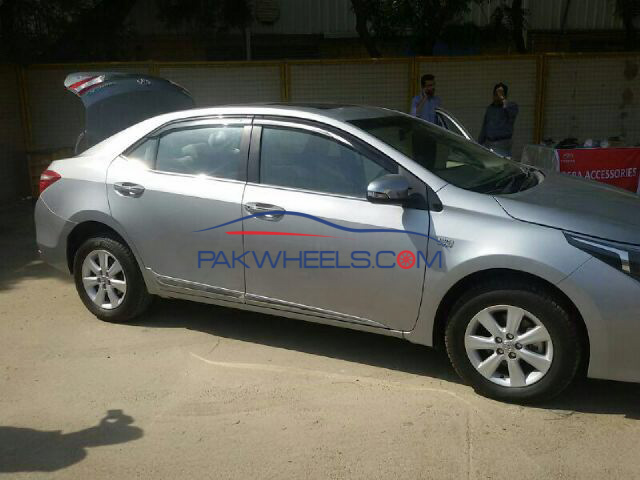 Wheels, I am sure you would’ve noticed in the first pictures we leaked, they are 15-inch 7-spoke wheels for the Altis. The new Altis then seems to be the reincarnation of the buffalo resembling Altis from 2006 which had a 1.8 liter engine, and a sun-roof most importantly, and it had some hype surrounding it during its launch which died down steadily to a complete stall when the 2009-10 1.6 liter Altis arrived and rightly so, because it was just another Corolla with a unnecessary bigger engine and price tag for something, only a bit different to say, Gli. The new one though, seems to be completely different car. And unfortunately, its beige.